As we've been suggesting for months, expect continued moderate price weakness in Gold and Silver through most of April 2019 and possibly into early May 2019 before a strong price rally will setup and push Gold prices well above $1500 before the end of 2019. Our Adaptive Dynamic Learning predictive price modeling system has been calling for this move for many months (see the chart below). This advanced predictive price modeling system is suggesting that in May/June of 2019, we will likely see a bigger price rally unfold in Gold and Silver which may be paired with some type of geopolitical or global economic event. See this article for more details. Gold rallies on fear (in most cases) and the only reason for Gold to really as our ADL predictive modeling system is suggesting is that some renewed level of fear could enter the global markets. This could be from any type of global crisis event or even a regional crisis event (think Brexit, EU crisis or some other foreign nation crisis). We believe skilled traders should be actively seeking to identify buying opportunities below $1295 in Gold as we only have about 20 days left before our original bottom/base date of April 21, 2019. This Gold Monthly chart, below, highlights the ADL predictive modeling systems expectations as well as the three support levels that we believe all Gold traders should be targeting. Gold is currently within the first target level and an opportunity to buy below $1295 would be an excellent starting position. Further, any additional opportunity to buy below $1250 should be an incredible opportunity – if it happens. Lastly, our lowest support level is below $1165. Although unlikely, if Gold retraces to below this level, then please don't miss this opportunity to get into additional long positions. Our ADL predictive price modeling system is suggesting that May & June 2019 will start a bullish price rally in Gold and Silver that should push prices well above $1500 by October/November 2019 – possibly much higher. Overall, we believe this could be the beginning of a much bigger upside leg in Precious metals and all traders need to be aware of this future price move. We've been suggesting this could be the “move of a lifetime” setting up in the metals because it will likely pair or align with some type of broader global stock market move to the downside. Our opinion is that May/June are dates that all traders should consider developing very protective positions as the markets shake up and Gold begins this incredible run higher. 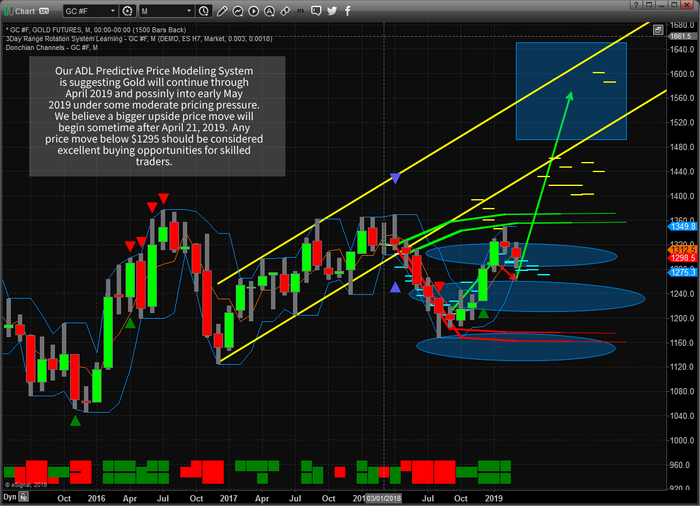 Take a minute to visit www.TheTechnicalTraders.com to learn how we help our members find and execute better trades while keeping them aware of market trends, cycles and key insights using our proprietary predictive price modeling utilities. We are certain you will find our research above and beyond anything else you've seen anywhere on the planet. Please consider joining our other hundreds of members in developing better skills and finding incredible opportunities for future success while trading with www.TheTechnicalTraders.com.